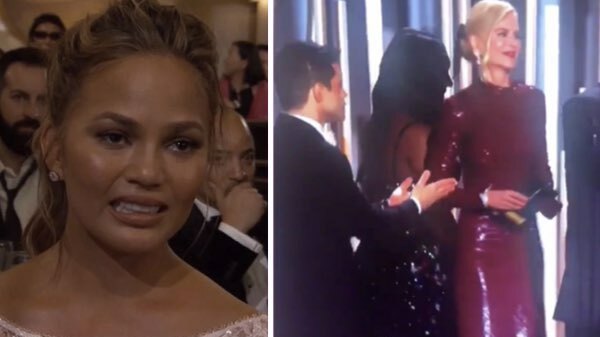 Yesterday’s Golden Globes has gifted us with a lot to talk about, mostly the ‘Fiji Water Girl’, but now we have the eternal gift of a very awkward Rami Malek getting blanked by Nicole Kidman after accepting the award for ‘Best Actor’. It is some truly cringeworthy stuff. We can assume that Kidman didn’t realise Malek was trying to speak to her. Or maybe, she just doesn’t know him…? Check it out below but prepare to feel incredibly bad for sweet angel Rami. Fans have praised the Bohemian Rhapsody star for handling the awkward encounter so well. And Nicole Kidman is such a first class woman she would have never ignored Rami. She just didn’t see him. Go see him in the movie- it will leave you breathless! Tbh, if I was in the presence of Kidman I would also pathetically attempt a convo, before accepting that we will never be friends and just be grateful we once shared oxygen.